Sargent Antique Stores really Rock along with Comstock Rock Festival! On the way to Comstock? 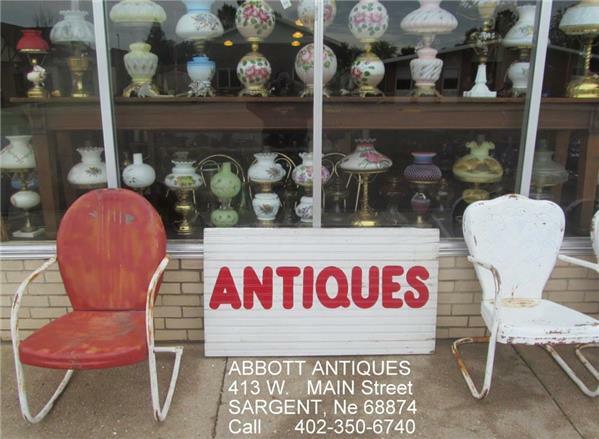 Save time to see why the Sargent Antique Stores “Rocks” Saturday July 21st 2019! Sargent is home to ten or more Antiques and/or Speciality shops loaded full of primitives, used furniture, home decor, glassware, and a wide range of additional collectibles. As always, the Sargent Antique Stores have the fabulous selection which both collectors and dealers have discovered exists in Sargent. Everyone will enjoy free admission, browsing and parking. Mr Rudy’s and The Ritz are your dining headquarters for Sargent “Rocks” Stock. Trotters offering food and cool down beverages of all sorts if you are in a rush. Bring your cooler and buy real meat, from real folks, with real clean stores with quality ingredients. See our facebook videos for Sargent Corner Market and Sargent Pack on 183Flea Facebook! Earthjunk is an online business in Sargent, Nebraska owned by John and Cindee Haddix. Earthjunk specializes in Like New Used Ethan Allen, Tell City Chair Co. and more American Made Investment Grade furniture brands. Earthjunk has over 2000 pieces of furniture in stock, one-third of which are online. With Earthjunk’s 20th Anniversary sale in progress, picking furniture up in Sargent has never been cheaper.